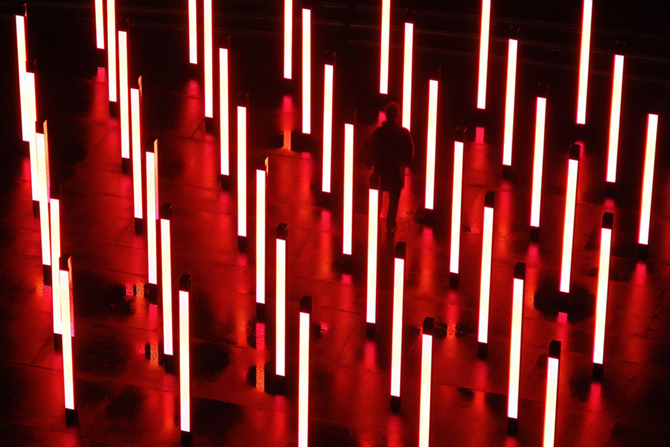 United Visual Artists are the collective behind some of the most striking installations and live performances, with a body of work that constantly crosses and redefines the boundaries of the design fields. With an emphasis on research and development, they have collaborated with artists and clients such as Massive Attack, U2, Prada, and Virgin Media. Architect Iker Gil interviews Matt Clark, co-founder and creative director of United Visual Artists. 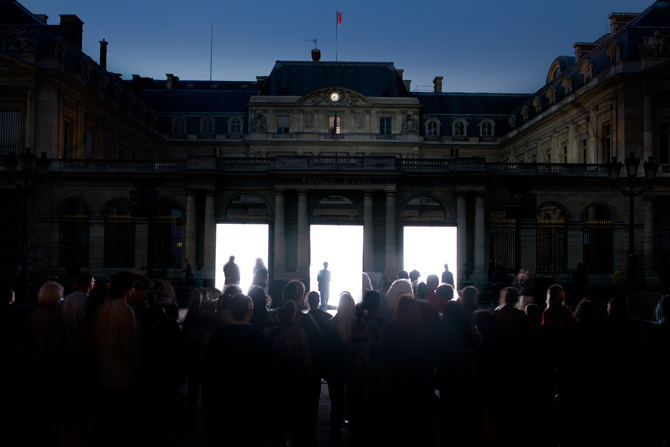 IG: How was United Visual Artists formed? MC: UVA was formed in 2003 by Chris Bird, Ash Nehru and me. We were all working as freelance creatives in the live performance and touring industry. We had worked together on few projects, but it was after the success of the 100th Window Tour for Massive Attack that we decided to set up a proper company. IG: UVA is composed of a group of people with a wide range of backgrounds. How is UVA structured and how does each person get involved in the projects? MC: My background is in fine art and design, Chris’s is in technical production and Ash studied computer science. We found that our different skills complimented each other’s and lead to a dynamic working process. We have continued to grow with a diverse set of skills, and this has lead to a wider range of projects and keeps things interesting and exciting for us. The key here is that everyone has his or her particular individual skill and is able to contribute creatively in their own different ways. We consider everyone at UVA equally important to the creative process – it’s what we built our ethos on. At the beginning of every project, a larger group will get together and put their thoughts on the table. Then people tend to break off into smaller units, depending on their specialism, to fit the project more appropriately. The skills we have in the studio range across architecture, programming, animation, lighting design, model making and more. The key is that people work beyond their skill set and knowledge is shared. IG: You have collaborated with the band Massive Attack for four of their world tours, starting in 2003 in what became your first project. Can you explain how this relationship started and how it has evolved? MC: We first met Massive Attack in 2003 after learning that they were looking for a new stage design for their 100th Window Tour. Robert Del Naja was looking for something visual that really communicated with the audience; he wasn’t interested in fluffy background textures or video, he wanted something that would make people think and feel. So together we came up with this super ambitious plan to base the show on information, real information that would change on a daily basis. 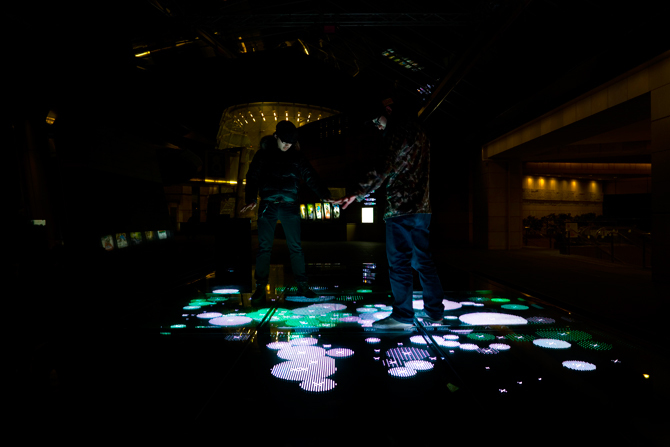 The show explored digital representations of information, filtering real-time news, stock-market prices, spam emails, local travel information, realtime statistical data, virus alerts etc, all translated into 36 languages including Japanese! This created a ‘picture of now’ and put people in the moment, it was a very powerful show and still probably some of the best work we have produced. 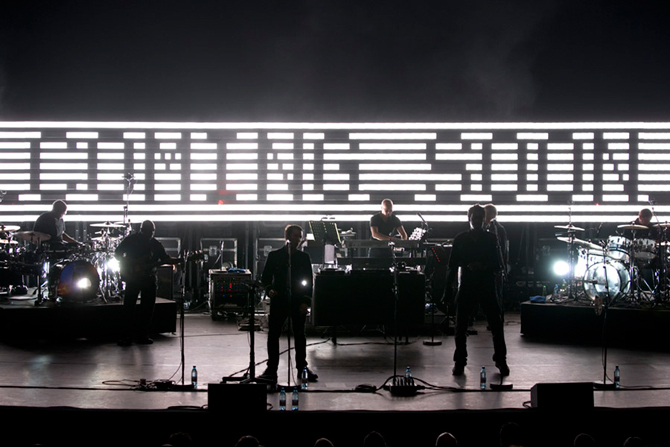 We went on to create more shows for Massive Attack, most of which have been smaller festival tours, and the stage design has to be far more compact and easier to construct because of time limitations. The most recent tour is more politically driven than the previous ones. Robert was into the idea of ‘sloganeering’, so we designed a very sculptural digital banner that he could add text treatments to as the tour progressed. At a show in Italy recently, Robert used a story that was about the deaths of young people in Police custody, and a screenshot of this went up on an Italian left-wing bloggers site and Massive Attack got a call from the Italian police saying that if they came back to Italy, they were not allowed to use this information or else they would be arrested. So it can be a far-reaching medium. IG: In the design for the world tours of Massive Attack, Jay-Z or U2 for example, among other things you ultimately design towards the amusement of the spectator. 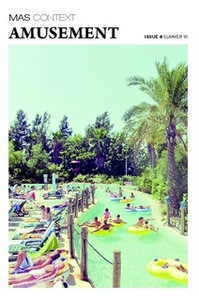 How do you design towards that amusement? MC: Generally, what we are doing is adding layers to the band or artist, they are the focal point and everything else should work from there. We create drama and contrast through light and rhythmical programming of visual elements. We always try to create a narrative for a show even if it’s quite abstract. This, however, can sometimes be frustratingly difficult, as every artists changes the set list right up until show time. IG: At a personal scale of amusement, several installations like Volume, Triptych and Contact explore the relationship between your work and the visitor. Can you talk a little bit about your research and explorations of these interactions? MC: When we develop an installation for the public realm, we always think about the layers of interaction between people and the work. There is the intimate relationship of the single person experience between them and the work, then the group experience of discovering that you are part of making a greater whole and sharing this with other participants. Outside of this, you have the audience and observers who are watching ‘the show’ where people are equally a part of creating the artwork. This is at the core of the development of all our work, how does it make people feel and behave. During the development phase of a project, we build prototypes and test them, and then once you are in situ you need to test everything again, as location and context changes everything. Often after opening night there is still a need to make a few changes, as you really only can see how an installation behaves once you have had a large number of people experiencing it. IG: The relationship between the simplicity, and in some cases minimalism, of the finished product and the complexity of technology happening behind the scenes is really interesting. In a way, it is a high-tech process that is not overwhelming for the end user, such as in the Speed of Light project. Can you talk about the relationship between simplicity and complexity in your work? MC: Our aim is for our work to communicate on an emotive level that makes you feel something, this is why we like to work with light. People are drawn to light like moths to a light bulb, it’s a powerful medium. 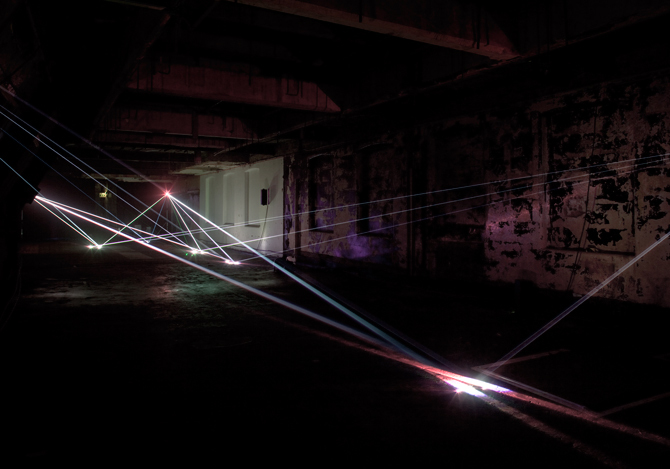 Working with light and controlling it does involve a lot of technology and control systems, but we are not interested in making this infrastructure a feature, we want the end experience to be as pure and impossibly simple as possible. That said, one of our recent projects, Chorus, involves 8 computer-controlled pendulums and is our most technically complex project yet. The mechanical aspect is a part of the aesthetic, it’s supposed to look like a gigantic mechanical musical instrument. IG: How do you assess risk in order to maintain success while being cutting edge? MC: Most of our projects have a risk factor, we are inventing bespoke systems and always working with new technologies. However, I don’t think being cutting edge is that important to us, as we often use old technologies but perhaps in new and unusual ways. As we grow, we are learning how to mitigate risk, but there has to be a a certain element of wandering into the unknown, otherwise things start to feel prescribed and that’s boring. IG: How do you approach the short-term duration of most of your work? Was Maple Leaf Square, your new permanent installation, approached in a different way? MC: The difference between temporary work and permanent is usually time scale and the durability of technologies and materials. With the installations in Toronto, we have had nearly 2 years to conceive, develop and build 2 permanent public installations, it can be a matter of weeks with temporary works and live performance design. It has been a steep learning curve designing large scale permanent public works, you have to guarantee the work for up to 50 years and the weather in Canada is extreme, so you have to be sure you are using the right materials. We do hope to continue working a mixture of temporary and long term projects, as they offer both short and long term disciplines which is interesting. IG: Which type of project do you enjoy producing the most? MC: We work on a wide range of projects now and we’re really lucky that nearly every project we embark on is exciting to us. I don’t think we can pin it down to one type of project, but moving into creating permanent work is an exciting step for us. IG: What one project would you like to work on but have not had the opportunity to yet? MC: My son is severely autistic, so I have been thinking of how our work could potentially be useful to people with sensory and communication disabilities. We’ve also always wanted to create an installation for the Turbine Hall of the Tate Modern, its such an incredible space. 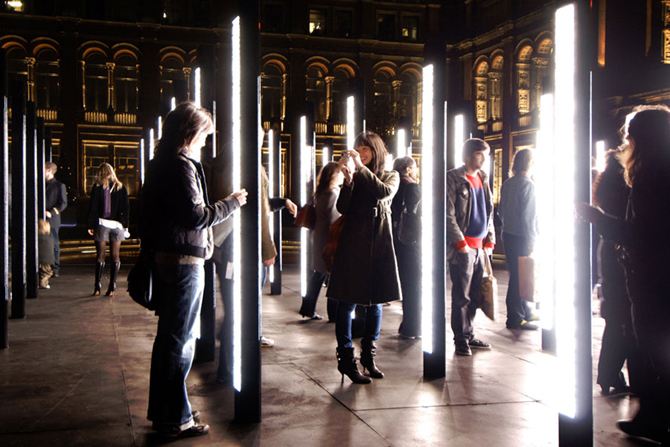 Matt Clark is the Creative Director of United Visual Artists (UVA), a London-based art and design practice he founded in 2003 along with Chris Bird and Ash Nehru. 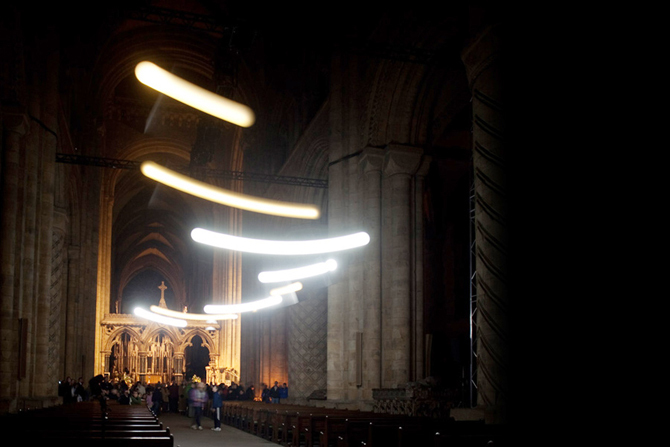 Their work spans architectural and responsive installations, live performance and public art.